Growing up, Spring’s arrival always coincided with the meteorological spring, but what has always stuck was the first spring holidays every year falling on March 8th, International Women’s Day. Men hurrying with tulips, cakes and chocolates trying not to leave their colleagues and loved ones out, that was sort of what we celebrated first before any Valentine’s day was introduced into our culture. This year East Coast has been served an obscene doze of snow and harsh weather, but at least it wasn’t snowing that day here! 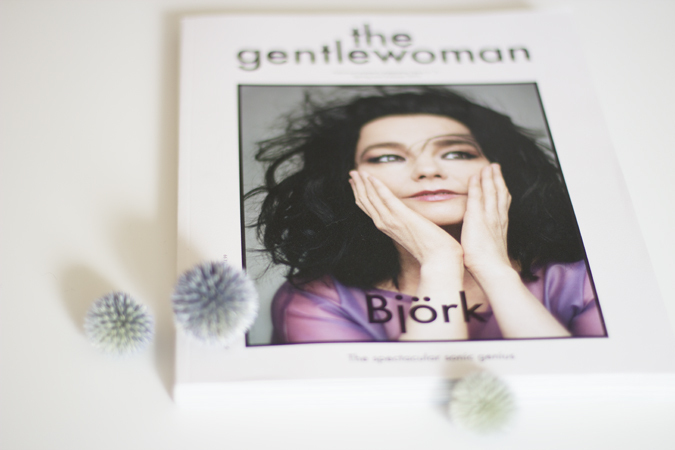 I was treated to my most favorite Lavender Moon cupcakes as I got to pour over the pages of the new issue of now my favorite magazine – The Gentlewoman. A true collective of great journalism covering stories of different and amazing women around the world. I really was hoping to spend that weekend in New York trying to attend Bjork exhibit at MoMA, but decided it was still too cold for a field trip and should wait until the madness around the exhibit dies down a bit and the temps warm up, that is probably wishful thinking. With Spring’s arrival many of us are longing to put away all those heavy knits and jackets to think of lighter garments and accessories we can enjoy wearing when the warmer weather finally arrives. 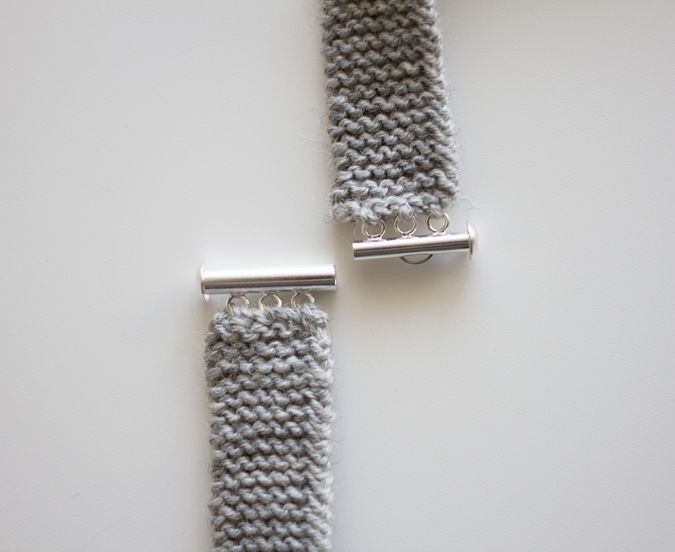 One of the most gratifying knits I have found are accessories as they are fast and pretty and can use up small quantities of yarn. 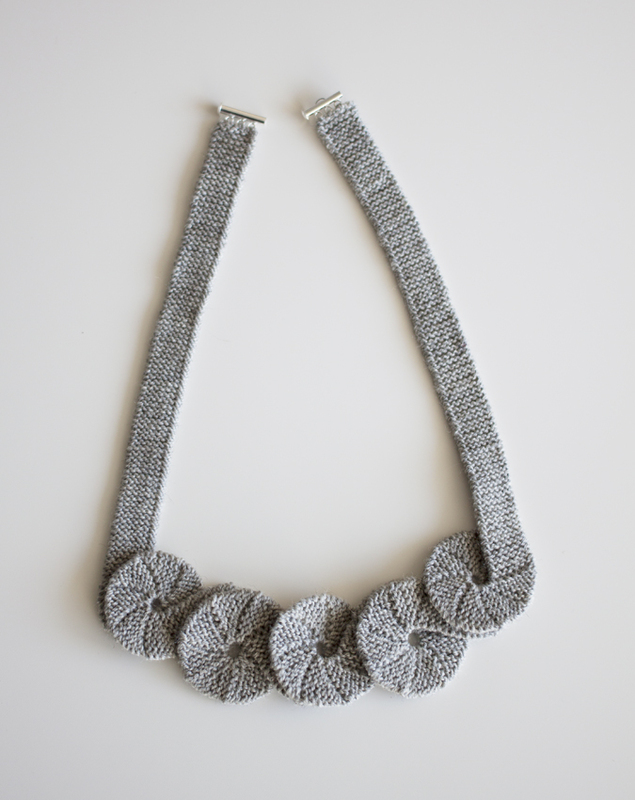 I have knit and designed several necklaces before and which brought me back to one of my all time favorite ones as it was inspired by something when I still lived in Japan. Swirl Necklace was commissioned by Blue Sky Alpaca‘s sister company, Spud & Chloe for their “On the Run” Series. Patterns for smaller projects that can be easily carried around and worked on while you on your way some place or have time on your hands in a waiting room. And all with a quick result! Ever since creating the sample for this, I have been missing having one for myself. So I have picked a skein of Spud & Chloe Fine in Hippo colorway at Fibre Space, my LYS, and my tiny dpns just for the convenience of carrying small needles around to work on this. Later, I have found a cool 3 eye sliding lock clasp for it for minimal finishing and here it is! 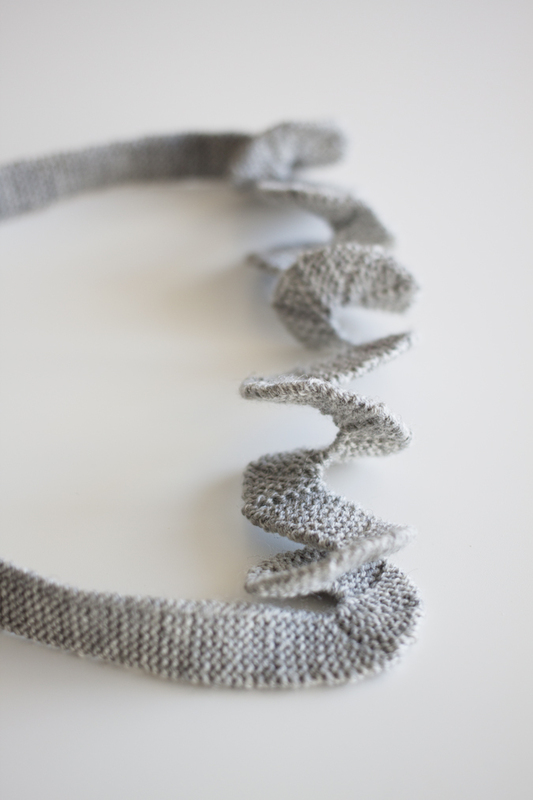 Even though the original necklace is not seamed to allow for movement of the “curls” in the circles, you can definitely make it more permanent by overlapping and stitching it up invisibly in several points as shown with some pins in a photo below. And even though the holiday has passed I think Spring is the time for renewal, new expectations and beginnings. You can continue celebrating Spring and women in your life or simply treat yourself this small Swirl Necklace that can make as a simple yet curious addition to your spring outfit or as a gift brighten the day of a woman you know! Or simply let you practice and learn some new skills while working on a small project with a gratifying and wearable result. 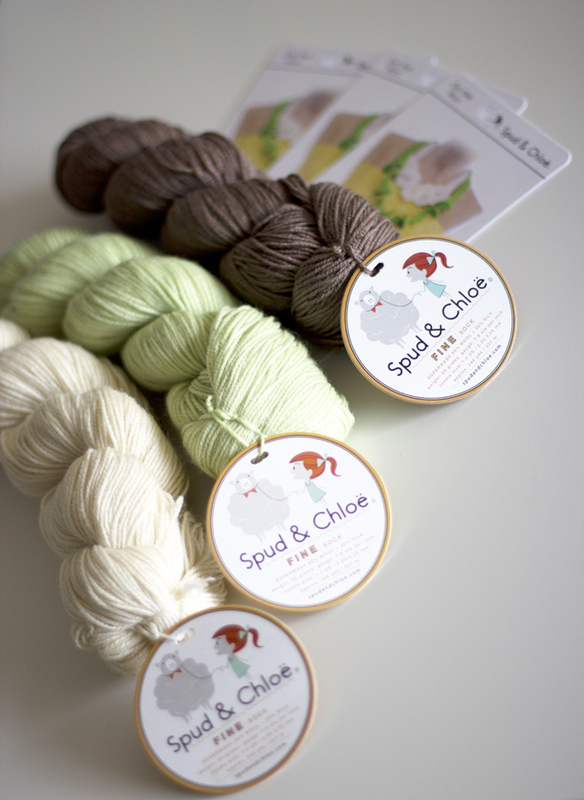 Team at Blue Sky Alpacas/Spud & Chloe kindly donated 3 skeins of Spud & Chloe Fine and 3 copies of Swirl Necklace patterns for me to giveaway to 3 lucky commenters! Please leave your comments by end of Monday, March 16th while I go dig out some spring clothes from my closet and hope for those temperatures to keep climbing up! Love how pretty and different this necklace is! Especially nice to see these loopy circles on Pi Day! To celebrate the day + number + form, I might start the tradition of knitting a different one of these each year! Mahalo for the design! Cute neckware, just what is needed In th early spring. What a gorgeous necklace, it has been on my to do list for some time and seeing it again made me want to do it right now to celebrate the arrival of spring. Thanks for the giveaway and crossing my fingers ! 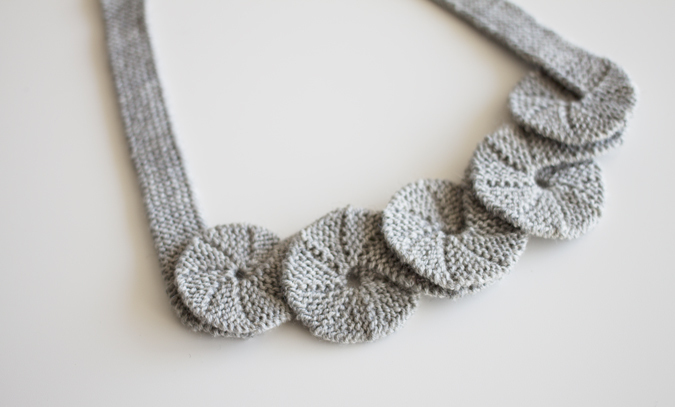 This necklace sounds like the perfect spring project! I’m getting to the point where I’m ready to be done with heavy, cozy woolens for a season, but I still have the urge to make something. I love it in that Hippo colorway you chose! I just love the simplicity of this necklace. It would be perfect to win it! Classe, épuré, essentiel… Happy springtime ! The perfect accessory and made out of my favourite material- wool! Such a beautiful design, Olga! Love, love the necklace! What a great accessory! The perfect knitted accessory to wear when the temperatures rise. I love the design, stitched down or not! Oh yes please Speing hurry up and arrive! OMG! I am having the BEST night! Just purchased some amazing wool, got inspired by incredible people on Instagram AND saw your exquitely delicate necklace! I want to make one for me and my daughter and my girlfriend! It will be just as wonderful to wear in Winter ( Australia) as in Spring! You are one clever Lady! What a great accessory. I would add some beads and make a couple for my 2 daughters. One is a knitter and the other is a crafter so they would really appreciate this type of accessory. Your creativity constantly amazes me. Love the necklace. It is so unique and whimsical! I would so very much love to win this gift. I have many sets of those little slide closures just crying out to be used. I have them in silver, gold and gunmetal. So, here’s hoping and thank you for the opportunity to win. What a genius idea for a necklace and to pair it with Spud and Chloe. Such a clever idea. To pin or not to pin, that is the question. 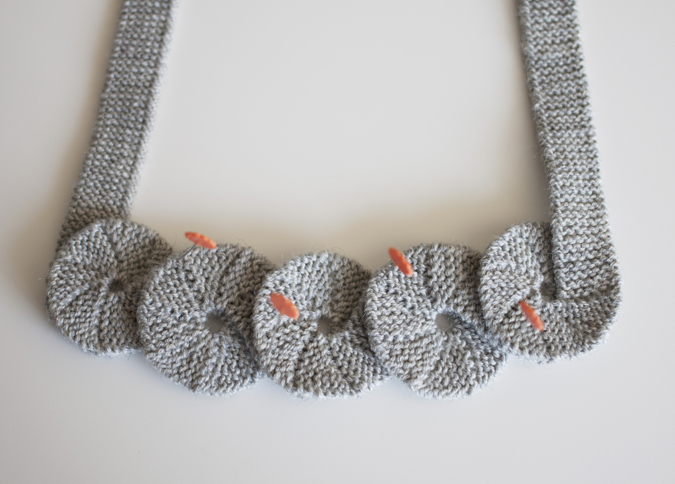 This is a lovely way to wear some gorgeous yarn around your neck but not wear a scarf. This would be the perfect necklace to wear to the Bjork exhibit! really enjoyed the steeling class at FibreSpace!